eMedia Singing For Dummies offers a fun way to learn to sing; step-by-step at your own pace. Songs and exercises in over 80 lessons with interactive feedback are accompanied by full-motion videos, live-recorded audio, and variable-speed MIDI tracks. The easy-to-follow lessons show you how to sing in time and in tune, use proper singing technique, and develop and project your voice. Professional voice instructor Ory Brown,. M.M., guides you with video demonstrations of techniques. Watch the techniques demonstrated in 30 full-motion videos. Sing along as the notes are highlighted on screen as they are heard. eMedia's Interactive Feedback technology actually listens as you sing and tells you whether you are too high, too low, or right in tune! Song looping lets you highlight and repeat any section of music you wish to practice. eMedia Singing For Dummies is the fast and easy way to learn to sing! eMedia Singing For Dummies also features hit songs including "Imagine" by John Lennon, "Dancing in the Street" made famous by Martha and the Vandellas, David Bowie and Mick Jagger, and Van Halen; "Stop in the Name of Love" made famous by Diana Ross and the Supremes and many more. eMedia Singing For Dummies also includes a built-in Metronome and Recorder. 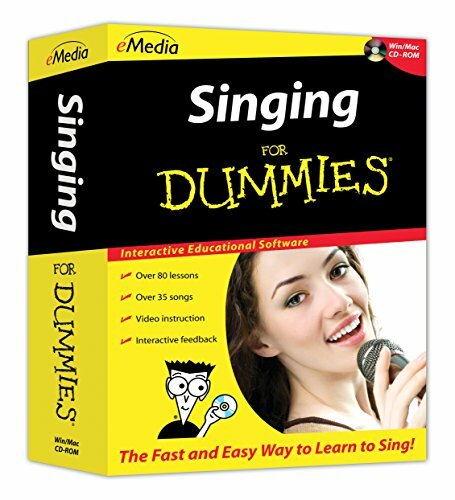 eMedia Singing For Dummies offers an exceptional value and will have you singing songs in no time! Over 30 videos and animations show you exactly what to do and explain how to do it. Interactive Feedback listens as you sing and tells you whether you are too high, too low or right in tune! Singing lessons teach you how to sing better with voice tutorials on matching pitch, essential sight reading skills, breathing, supporting your voice, understanding resonance, and how to form vowels and consonants. Interactive Feedback technology that displays the notes you’re singing on screen in notation, as the software listens to your singing via the computer microphone.